In the backdrop, a charming, red roofed building which houses the information centre in the town of Wawa, Ontario looks miniature against the gigantic Canada Goose statue. Wawa Lake is home to hundreds of Canada Geese during the spring and fall and the community of Wawa decided to make this bird its mascot. The name Wawa originated from the word "wewe" meaning wild goose in Ojibew. After 1963, a proposal went through and the 28 foot high statue became an important landmark. Many visitors to the town of Wawa will stop by the information centre and capture a picture of the mighty Canada Goose statue standing amongst the flower beds. Statue of Canadian Goose at the Information Centre in the town of Wawa, Ontario, Canada. 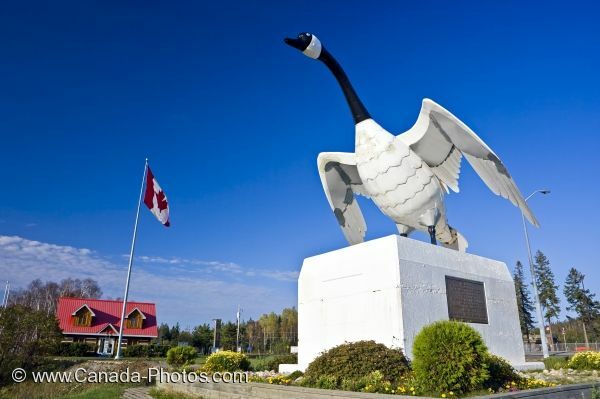 Picture of a Canada Goose statue standing outside the information centre in the town of Wawa, Ontario in Canada.